Discussing trees with my Master Naturalist class the other night, it became clear to me that I’ve forgotten much of what I learned long ago about plant reproduction. And now that I am studying trees, I realize that tree reproduction is more complex than I ever imagined! Let’s see. . . . .I remember that trees reproduce sexually, although I now know that some trees, like the paw paw, can also produce asexually, or ‘clonally’ by spreading runners under the ground when the right pollinating animal no longer lives in the area. But back to the reproductive life of trees: They reproduce when the pollen–the male part of the process–fertilizes the egg–the female. From fertilized eggs, then, come seeds, which are dispersed. Some of the seeds take root, and the next generation is launched. That’s the three-sentence summary. As with herbaceous plants, trees have evolved an incredible array of methods for getting the pollen and the egg together and for dispersing the seeds that result from their ‘parents’ union.’ In some species, for example, the pollen from male flowers, catkins, or cones, is blown by the wind to the female flowers, on another tree or on the same tree. With other species, it is insects who transfer the pollen to the female flowers. Once pollination has occurred, the resulting seeds need to get into a good spot of earth to germinate and grow new trees. As with pollination, nature has evolved ingenious ways to get the job done. Wind, water, and animals are all ‘used’ by trees to move their seeds away, to another spot where they might take root and grow. Interestingly, the trees that depend mainly on wind dispersal produce volumes more seeds, since the odds that any one seed will be blown to a favorable spot and take root are very slim. Trees that produce seeds eaten by animals, however, like the oak’s acorns, are far fewer. Such seeds have a much better chance of being carried to–and ‘deposited’ in–a favorable location where they can germinate. So not nearly as many of these kinds of seeds are needed to perpetuate the species. Although quite incredible, this all sounds straightforward enough. But I am still puzzled. When I walked down into the woods yesterday morning, I looked at the catkins of tiny flowers hanging from striped maples. Some of the little trees had them, and some appeared to have no flowers at all. So, how, I wondered, would pollination take place when some of the trees lacked an ‘organ’ for bringing pollen and egg together? As you can imagine from the title of Primack’s article, the red maple’s reproduction is even more complex than that of the striped maple! In fact, right now as I look out admiringly at a red maple, with its already well-developed winged seeds, or fruit, I contemplate the fact that it is a female tree, at least for now. You see, according to Primack, some red maples produce female flowers, others produce male flowers, and some even produce both kinds! But red maple reproduction is more complicated still. Primack writes that botanists had been puzzled to find male red maples producing fruit! He decided to study red maples to find out what was going on. Starting in 1979, he monitored a group of 79 red maples for many years. He concluded that 53 of them were male, and always produced male flowers. Six of the trees were mostly male. That is, they produced mainly male flowers, but in some years also produced a few female flowers. Twelve more trees were constant females, producing only female flowers every year. And six more were mostly female, also producing a few male flowers in some years. And then there were two trees that produced ’perfect’ flowers, botanese for flowers that have both male and female parts and thus self-pollinate. Primack’s findings are fascinating. But I am still left with questions. Is his sample of red maples truly representative of the entire species? Are the overwhelming majority of red maples male? I also wonder how red maples are pollinated. Wind? Insects? I tried to find the answer to that question, but it seems open to debate. Some say wind only; others maintain that bees love the red maple flowers and thus must be transferring pollen. For the first time in more than a century, a California condor chick has hatched inside Pinnacles National Monument, the federal wildlife reserve in California that was once the species’ domain. The young condor chick brings the total number of California condors in the world to 350. Biologists and others have been celebrating the birth. After all, this bird–the largest North American land bird–was at the brink of extinction less than 30 years ago. In 1982, only 22 of the birds were left in the world, thanks to habitat loss, poaching, and lead poisoning. Those birds were then placed in a captive breeding program at the San Diego Wild Animal Park and the Los Angeles Zoo. By 1991, the condors’ numbers had increased enough that biologists could begin reintroducing the birds into the wild, to their native California and the Southwest. Now, about 180 of the 350 California condors live free in the Grand Canyon area, Zion National Park in Utah, and in the coastal mountains of California and northern Baja California. The newest condor chick is being raised by a female who was released into the wild in 2004 at Pinnacles and by a male released that same year on the California coast. The couple had produced an egg that proved not viable, so biologists replaced the egg in the bird’s nest with a fertile condor egg. The California condor is an impressive bird. It is a black vulture with a largely bald head. The skin color of the bird’s head ranges from yellowish to bright red, depending on the bird’s mood! The wingspan of the California condor is wider than that of any North American bird, and the condor is one of the longest-living birds in the world. 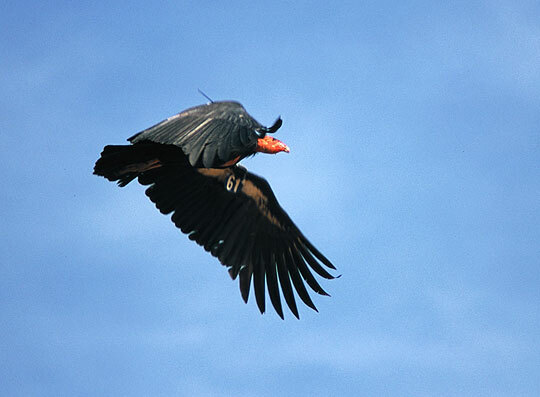 A California condor can live for up to 50 years. 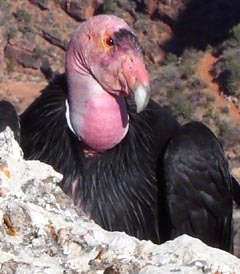 A scavenger, the condor eats large amounts of carrion. It is a moonlit night in the Hawaiian Islands. A bobtail squid is gliding along through shallow waters. But despite the moonlight, the squid casts no shadow on the seafloor as it swims. Why not? Since a moving shadow in the moonlight could alert the squid’s predators to the animal’s presence, this creature has evolved an incredible mechanism to avoid casting a shadow. When darkness alone won’t serve to hide the squid, it produces its own light, which shines downward onto the seafloor. The squid can even modulate the brightness of the light it generates, so that it matches the intensity of the surrounding moonlight on the seafloor! How is the squid able to protect itself in this amazing way? Scientists have discovered the squid’s secret. The bobtail squid has a bioluminescent organ on its underside. Inside this organ is a population of bacteria that glow in response to changes in oxygen concentrations in the squid. Inside cells around the bioluminescent organ, as well as in cells in the skin, ink sac, and around the eyes, are reflective, iridescent structures, called platelets, that reflect the bacterial light. While many aquatic creatures can reflect light, they cannot modulate their light to match surrounding light, as the bobtail squid can. The platelets of these other light-reflecting animals have a rigid structure that does not allow for changes in reflectivity. The squid’s platelets, however, are made of flexible protein structures that allow the animal to alter its reflectivity. Hence, the bobtail squid’s ability to match its own downard shining light with the intensity of the moonlight shining on the seafloor. Trees, those marvelous beings who absorb carbon from the air, who provide habitat for numberless species, who refresh us with their shade and beauty, are doing well in an important way. According to a new United Nations study, the worldwide rate of deforestation has declined for the very first time. The years 2000-2009 saw a significant drop in deforestation from the previous decade. Deforestation during the 1990s averaged more than 20 million acres of forested land lost per year, compared to 12.8 million forested acres lost annually since 2000. The reason for this first-ever decline in the deforestation rate, say the authors of the study, is the growth in tree planting programs. In the United States, China, Brazil, Vietnam, India, Indonesia, and in many other countries around the world, tree planting programs have increased forest coverage by millions of acres per year, according to the UN report. A lower deforestation rate, combined with newly planted forests, “have helped bring down the rate of carbon emissions,” said Mette Loyche Wilkie of the UN Food and Agriculture Organization. Despite this excellent news, researchers are concerned that deforestation rates will again start to climb. Scientists point out that global warming is devastating millions of acres of trees, as warmer temperatures lead to more insects and more damage to trees. Another concern is that some replanting programs are scheduled to end in the next few years. Yet another worry is agriculture. UN scientists are studying the impact that clearing millions of acres of forest for crops and livestock has on deforestation. I raise another concern. I have read that some tree planting programs are not well-planned, with biodiversity and the complexity of a healthy forest in mind. Planting the wrong tree species or too few species of trees may make for a much less healthy forest system than the original forest cover. I confess; I am a worry wart. Sometimes at night, a thorny problem looms large and keeps me awake. Last night was such a night, and so I arose this morning feeling tired. I knew just the antidote. I got dressed and walked down into the forest. Low in energy, I simply lay on the ground. The earth supported me, and slight breezes touched my forehead and hair. Immediately I was soothed. All that had bothered me during the night softened and faded into the background. Calmed and happy, I gazed upward. In the high, high tops of the chestnut oaks, little, yellow-green leaves fluttered and waved in the sunshine. How new they looked, with their diminutive size and yellowish color. There is indeed something special about leaves when they are young, fresh out of the bud, before they have reached their darker green, summer maturity. And now that I was feeling refreshed, I decided to get up and see how the baby leaves of some of the other trees in the forest were coming along. I started with a visit to a nearby white oak. Little groups of very thin, green leaves fluttered together at the tips of its twigs. I couldn’t resist handling one of the little groups. But in my attempt to separate two of the leaves, who had yet to pull apart and lift upward, the entire group of leaves came off in my hand. I was briefly aghast, having destroyed such youth and complexity. But as I looked about at the many other little clusters of leaves dotting the tree’s twigs, I reminded myself that my clumsiness wouldn’t cost the tree much. Then there are the red maples, always worth a visit. While these leaves have been growing for more than a week now, most are still slightly folded downward, flimsy and soft to the touch. They too will soon firm up, and stretch outward and upward. Another one of my favorites is the tupelo. Never are its leaves droopy; they start out perky, pairs of them opening upward together. But now that they are getting bigger, they seem to be relaxing outward, closer to the mature leaves they will become than to the babes they have just been. Just a few steps away was a little pine tree. At every single tip of its flexible branches was a small, yellowish growth, covered with tiny, rubbery ‘spikes’ destined to become green needles. Now these rubbery little points are but a hint of what is to come. And finally, the moosewood. The little tree’s delicate branches were dotted with buds, broken open by tiny leaves pushing their way out. Pressed together, the emerging leaves seemed to be striving forward, out into the world. Many of the moosewood’s leaves were already fully out, their bud covers peeled back, their work finished. These shiny, bright green leaves were already a good size, although they will grow much bigger still. With a pleasure that surprised me, I stroked a moosewood leaf between my fingers. How moist and bright green, how light and flexible. The depth of its many veins made the leaf seem more three-dimensional than two. Feeling the little moosewood leaf so new, so full of life, I imagined the leaves around me as not that different from human skin–so soft and silky at the start, gaining firmness with maturity, and finally losing suppleness, drying, cracking, and becoming discolored in old age. Earth Day is Thursday, April 22. This year marks the 40th anniversary of the very first Earth Day in 1970, and the earth needs your help now more than ever. About a billion people in more than 190 countries are expected to participate in some sort of Earth Day action to help bring about a healthy, sustainable planet. Many of these actions will take place on Thursday, April 22, while others are planned for the weekend before or after Earth Day. Some groups are even planning an entire Earth Week of varied activities to celebrate, educate, and advocate on behalf of the planet. Neighborhood and beach clean-ups, habitat restoration activities, visits to state legislators, climate teach-ins, tree and milkweed planting, recycling of prom clothing, and a solar cookout are just a tiny fraction of events planned around the country. In addition to the scores of activities going on in towns and cities across the U.S., there will be a nationwide action in Washington, DC. Concerned Americans will join together on the National Mall on Sunday, April 25, to urge Congress to enact comprehensive climate legislation. Yellow, it appears, is the color that announces spring. The earliest bloomers I notice around me are all the yellow ones. This year, unlike past springs I can remember, the daffodils were first. Even before this winter’s deluge of snow had completely disappeared, the bulbous tips were pushing their way up out of the wet soil. And as these perennial harbingers of spring grew and opened in their bright, creamy-smelling yellowness, I remembered why the spring feels like such a gift after months of winter. Right along with the daffodils, or just slightly later, came the forsythia. Wild and rangy, with a Van Gogh-like, mad energy, these bright yellow branches charged this way and that, along the driveway, along the road. Now they are being tamed by the growing green along their branches, their wildness transforming into just another staid, green bush. Then there was spicebush. The forest where my friend and I hiked recently was still mostly leafless and brown. But tiny, floating globes of soft yellow dotted our views, near and far– the blossoms of these woody shrubs. I like the name ‘spicebush.’ It conjures up inviting cooking smells. But, in fact, I find the spicebush scent an astringent one, similar to witch hazel, another yellow bloomer. Finally, in my tribute to yellow, comes coltsfoot. The name of this dear, unassuming little flower is about as sweet as the plant itself. Someone, sometime, must have likened this narrow, close-to-the-ground, little bloom to the foot of a very young horse. This year it was a relief to finally see some coltsfoot along the road at the top of our ridge, long after the other yellow flowers had already bloomed. Usually, coltsfoot is the first spot of color along the road in the early spring. But this year, for some reason, it showed up last among the yellows. A warm and sunny spring morning. Does it get any better than this? Since I was up earlier than usual today, I decided it was a perfect time to get outside and see what I could see. And I was richly rewarded. As I stepped out into the driveway, I was treated to varied and sweet twitterings. Would that I could tell one bird’s call from another’s. I was never good at distinguishing the different instruments in an orchestra either. But no matter. The different birds’ songs filled the air with a sweetness that touched my heart. Glancing about, I noticed some birds, tiny in the distance, dotting the highest branches of a chinkapin oak. At such a distance, I couldn’t distinguish their species. But the binoculars soon revealed them to be goldfinches. Bright yellow males and dull, vaguely yellow females perched here and there at the tips of twigs. A few sat still, and a few flitted about within the tree. Most, however, appeared to be eating the buds at the end of the twigs. One male even hung upside down from a twig, the better to get his beak around a bud. After a few minutes, all the goldfinches suddenly flew out of the tree and soared, high overhead, off into the distance. Then, moments later, they were all back again (unless it was others who looked just like them). They resumed their activities in the first tree, just as before. Why had they suddenly left? And why did they so suddenly return? And why do they seem to like only the chinkapin buds, and not those of the nearby chestnut oak or the red maple? You are currently browsing the Earth Connection blog archives for April, 2010.